Nancy Friedemann was born and raised in Bogotà, Colombia by US father and Colombian mother. The activity of her father - who was a jeweller - and of her mother - who was an anthropologist - have a significant influence on her work. After her studies at the Universitadad de los Andes in Bogotà and at the BFA Otis Art Institute in Los Angeles, in 1990 she moves to New York, where she attends from 1994 to 1997 the MFA New York University, and where she presently lives and works. Nancy Friedemann's works have been shown in a number of solo and group exhibition in Colombia, in New York, Boston, Chicago, and in Europe (Colombian Embassy in The Hague, Netherlands - Casa de America, Madrid, Spain - Galerie Rainer Wehr, Stuttgart, Germany - Gasworks Gallery, London, UK); they are also part of various collections such as the Museo de Arte Contemporaneo MAC in Bogotà and the Museo de Arte Contemporaneo in Panama City. Reading and "translating" the work of Nancy Friedemann is very much similar to unravelling a muddled ball of yarn. Better, using one of the gestural signs preferred by the artist, it very much resembles the act of undoing a crochet doily. The beginning and the end of such a process are perhaps represented by a loss. And whether one will recover from that loss or not is not sure. What is sure are only the remaining traces of the process involved: a continuous wavering between demolishing the past and building the present, an experience that takes time, labour, and implies memories. Reading the work of Nancy Friedemann means that her work is not too far from that of a writer, and drawing and writing are in fact the two faces of the same autobiographical subject. In Nancy Friedemann's work it is recognisable a movement from the initial interest in painting up to the 1990, when she was still living and working in Bogotà, towards a progressive deconstruction and lightening of the material elements implied in painting, which has increased since she moved to New York in 1990. Thus, painting became first abstract, then lost frames and stretch bars, which were considered by the artist herself as historical and practical constraints. Then the artist's stroke started fluctuating in a less structured, more experimental context. After the first five difficult years spent in New York, from 1990 to 1995, Mirror, dated 1996, is amongst the first works to have lost the stretch bars. Its loose and big canvanses investigate and engage the whole space in which they are located. In the use of drawing and paint, of drawing and text there is something similar to the movements to define the self in an unknown environment. The title of this work is not accidental. Freed from the past constraints, the artist's drawings vacate in search for some reference, some directions to follow. Whilst the text, herewith rewritten, from a song of the Mexican singer Luis Miguel seems to provide such directions, its nostalgic and melancholic content reflects, as in a mirror, an unconfortable state of uncertainty. The use of text, just approached, was then to be left behind for a while in order to better explore another element which is predominant in Friedemann: the structure of the crochet doily. Such a recurrent and almost obsessive presence not only refers to Friedemann's general interest in textiles, but it represents a highly symbolical object always initiating, in the artist's practice, an investigation into family memories, women's traditional practices, rituals and emotions, into « the continuous effectiveness of old ways of thinking, and their unconscious effect in contemporary situations in the form of social inertia 2 ». 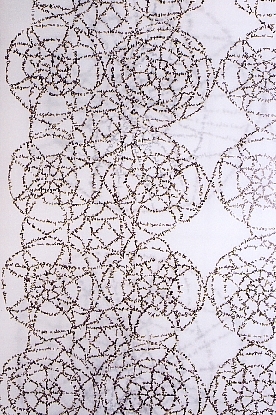 The doily's patterns and structures, methodically repeated by our ancestrors in an active/passive daily routine, represent on one side a solid and certain ground to accept as a calming source of confidence; on the other side the monotonous and closed nature of the work demands for a rebellion, for an abandonment to the loose, unsafe and unpredictable course of our unconscious drives, for the active expression of our desires. Friedemann's practice aims at going back over such a ritual as that of crocheting: but whilst reproducing it patiently, she is in fact re-appropriating a practice in its time-consuming typical manner, she is re-performing it and together she is deconstructing its elements in order to deploy them for different orders, towards different meanings, in order to free them from their obsessive passive character and provide them with beautiful and inner purposes redundant of melancholy. The laborious installation made of broken eggshells in 1996 is a re-enactement of the chochet structure, adopting different, more fragile materials, and allowing the same structure to float and disperse itself along the walls. Referring to the death of her grandmother, and again to the difficulties of adapting to a different rhythm and lifestyle in New York, this work suggests a sense of loss, and an attempt to reconstruct an identity from that loss. Towards this reconstruction, Beginnings (1997) is a complex development, in which contradictory tendencies are gestured. Here the crochet is deconstructed up to the minimal element of three-dimentional stitches worked with plasticine. These organic fragments, remains of memories, are then reorganised according to a new taxonomy which mimes the museum's methods of classification and their displays (Nancy Friedemann's mother was an anthropologist and worked in a museum for many years). If the frames try to enclose and interprete the elements of the artworks in a more rigorous and rational way, the same elements claim in their organic and still fragmented character a return to the lost nature they belonged to. 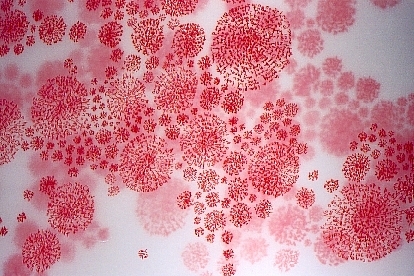 In some of Friedemann's works these dialogues between the organic mutant state of the elements and their fixed organisation in systems express an ongoing dilemma without a unique and final solution, whose understanding is only in the process of the work. In this direction, some of the following works present the readoption of text and writing as essential means of, together, expression and communication. Text is not uniquely made of discursive meaning and communicating content, it is also here considered in its materiality and in the performance of language it expresses, in its visual pictorial aspect and in the trace of the hand on the paper. Barthes comes to mind, that Barthes interested in the "practice of writing", in particular in his Variations sur l'ecriture 3. Also experiments in visual and concrete poetry come to mind, where text is considered for its visual appearance 4 ». What is interesting, however, in Friedemann's works is the fact that the difference between the act of drawing and that of writing is erased in the same gesture which also attempts to "symbolising the self and its reality" 5 ». 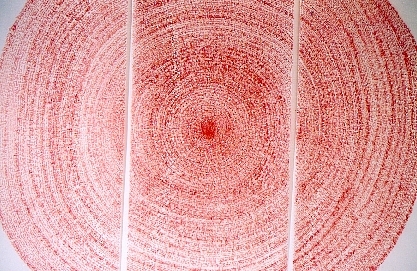 Friedemann stated that « the text is transformed while becoming a visual element that retains part of its original meaning, but then vanishes into what could be the web of memory 6 ». Far from solving the mentioned dilemmas between static and organic, structure and disorder, construction and disruption, the insertion of writing in her work constitutes an additional tool to map and remap inner movements, precarious thoughts, and negotiate the artist's identity. In the Fantasy about a Pilgrim Story, 24 panels of stretched canvases reproduce 24 pages of a story from Garcia Marquez's Pilgrim Tales, handwritten by the artist using the centre of the structure of a crochet doily as a stand in for snowflakes. Given the content of the story - between a critique of Colombian society and a story of love and loss -, these panels are somehow composed in the form of love letters somewhere washed away by invisible tears, therefore blurring, and still protected by a thick layer of latex as to retain the emotional impact and preserve it. In the Candid translated (1997) the circuit of writing is represented in a spiral movement which the artist followed while she was producing the translation of the well known Voltaire's Candide from English to Spanish on large wood painted disks. The spiral is a recurring form in Nancy Friedemann's work, together with a general circular movement that, as we said before, repeats and re-enacts the circular composition of the crochet doily. In the Candid the spiral seems to refer to the cycle of time and its repetitive nature, to a nomadic journey following an ideal and ending where it started. Elsewhere it is the manifestation of a challenging mission, as in the physically demanding and highly personal work of Accumulation (2001). Here Friedemann used both left and right hands to produce automatic writing in both English and Spanish, the languagues in which the artist expresses herself. Automatic writing is another kind of text adopted by the artist and again in strict interrelation with the notion of drawing as described above. Automatic writing is here used as a function of the memory, as a means to explore the relation between communicating and expressing emotions. Far from the illusion of the truth researched by the modern Surrealist experience, Nancy Friedemann's automatic writing is closer to the one adopted by contemporary women artists, such as Susan Hiller, as an alternative language, whose compromise between ratio and unconscious can bring forward a representation of the real translated in a different perspective, more or less informed by feminist concerns. In Accumulation the conflict between desire and law performed in the circular composition, while not strictly concerned with feminist issues, digs into its own complexity. The almost monumental nature of this work (its measures are 8 x 12 feet), increased by the long and tiring process implied to complete such a labour is significantly broken by the three separate panels on which the work is produced, and by the intertwining movements of the double text, which is then made hardly readible. The number of opposite concerns performed here (as we said, desire and law, mourning and transformation, communication and expression) are engaged in an exhausting confrontation between the aesthetic beauty of lightness and such a dramatic performance and execution. 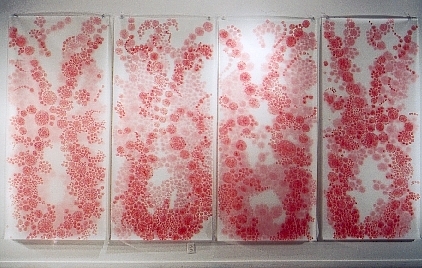 The increasing use of sheets of mylar as supporting material for the drawings, and their layering as in works such as Alchemies and The Good Earth (both dates 2001) suggests an interest in maintaining the mentioned balance between a light beauty and a sense of time passing by in its multiple facets. The decorative aspects of the artist's work don't stand independently from other concerns: they are intermingled with memories, traditions, inner dilemmas. If the works of Nancy Friedemann is less directly and literally engaged in politics than in other Columbian artists from her generation, this is because the collective memory, for this artist, has to pass through the individual in order to be then re-enacted and re-presented in the artwork. It has to be personally experienced in its resonances and dramas, and avoid rethorics. Elements of the Columbian tradition are still present in Friedemann's works (for instance, in the Precolombian spindle appearing in Terra Incognita, or the adoption of Garcia Marquez' text encompassing a description and critique of Colombian social habits), but are interpreted through the complex net in which the social, the political, the gendered, and the individual are closely and intricately knitted. Thus, within a recent project at the Queen's Museum in New York, a monumental Poporo was drawn on the walls of the Museum with the rewriting of a text by a Columbian journalist about the state of Columbia and the phenomenon of the drug cartels. This drawing is then accompanied by the re-writing of Marguerite Duras' Practicalities, in which personal issues (death of beloved, affairs, alcoholism, etc) are more in focus. The social and the personal are to cohexist in the same environment, each shaped by the nomadic lines of drawings. It is, thus, through these lines that Nancy Friedemann explores her being half Columbian, half North-American, her being a woman but not necessarily a feminist, her remembering and yet living in the present, her performing and believing in the resonances of the process between past and future. Although her research for a beautiful balance seems to be continuously accompanied by a necessary sense of loss, it is the continuing experience of producing works to validate such a consuming exercise and it is the labour and time involved to transform the efforts in the beauty of lightness. 1 Ed. by Deanna Petherbridge, The Primacy of Drawing, South Bank Centre, London, 1991. 2 N. Friedemann, Artist's Statement. 3Unfortunately the editor has presently access only to the Italian version of this text. R. Barthes, Variazioni sulla scrittura, Torino, 1999, p. 6: « [...] la scrittura, storicamente, è un'attività continuamente contraddittoria, articolata su una duplice istanza: per una parte è un oggetto strettamente mercantile, uno strumento di potere e di segregazione, intinto nel fondo più crudo delle società; e dall'altra, è una pratica di godimento, legata alle profondità pulsionali del corpo e alle produzioni più sottili e più felicemente riuscite dell'arte.» See also p. 43: « ... la scrittura implica tre determinazioni semantiche principali: 1) è un gesto manuale, opposto al gesto vocale ... 2) è un registro legale di contrassegni indelebili, destinati a trionfare sul tempo, sull'oblio, sull'errore, sulla menzogna; 3) è una pratica infinita, nella quale tutto il soggetto è coinvolto, e quest'attività si oppone di conseguenza alla semplice trascrizione dei messaggi. In tal modo Scrittura entra in opposizione ora con Parola ..., ora con Scrivimento ... Insomma è, secondo gli usi e le filosofie: un gesto, una Legge, un diletto." 4 For further details on visual and concrete poetry, see J. Drucker, Figuring the Word, NYC, 1998. 6 N. Friedemann, Artists' Statement. Camilo Calderon, Paganos y Piadosos, "El Espectador", Magazin Dominical, Bogotà, March 1989, p. 4. 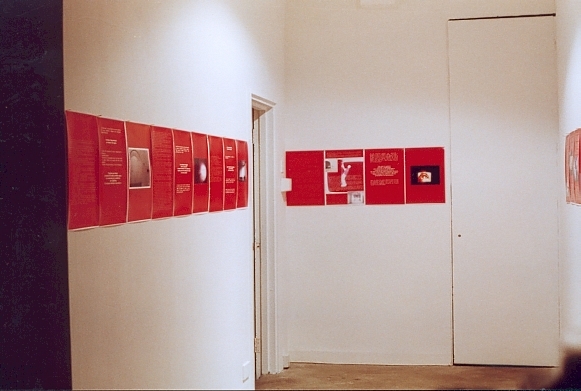 Rodolfo Charria, catalogo di Arte Actual Colombiano, Casa de America, Madrid, Spain, 1994. Camilo Calderon, Enciclopedia del Arte Colombiano, "Circulo de lectores", Bogotà, 1995. Marcela Medina, Revista Alo, Bogotà, March 1997, p. 16. Eduardo Serrano, Tres puntos de vista, "Revista Semana", Bogot&qgrave;, March 1997, p. 35. CNNfn, It's only money, TV interview to Sarah Meltzer, 2 June 1997. Maria Teresa Guerrero, Tres Mujeres Artistas, Tres Caminos, "Arte en Colombia & Art Nexus", July-	September 1997, p. 119. Jean Hess, on A1 Lab Knoxville/Tennessee, "Art Papers", September 1998. Holland Cotter, One Museum, Five Shows and a Million Lives and Passions, "New York Times", 14 August 1998. Axel Bruggemann, Ich darf Keine Plane machen. Vier Sudamerikanische Kunstler bein Ruta Correa, Kultur Joker, Kultur-und Veranstaltungszeitung, Jahrgang, 4 August 2000.